This set comes in "Black and Ivory". 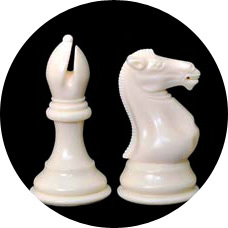 Heavily Weighted Plastic Chess Set with 4" King! Featuring a 4" King with a 1.875" diameter base, this heavily weighted set is one of the nicest plastic sets you will find. Each piece is exquisitely crafted and will endure for years to come. Ideal for tournament or blitz games, you will be the envy of all of the other chess players when you break out these beautifully designed pieces and set them up on your chess board! This classy set is available in colors Black & Ivory.